Can you conjure up a newly retooled version of the beloved Just Joey? Now you've got a little feel for the opulent warm beauty of this resplendent Hybrid Tea. 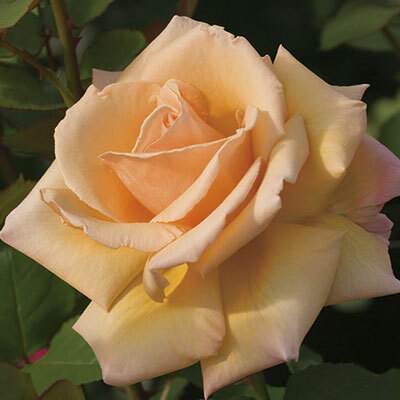 Reminiscent of a monstrous silk rose on a lady's hat, big voluptuous deep-apricot buds spiral open to slightly-softened caramel-sugar tones that glow like a beacon against the lush green leaves. The rounded, bushy & vigorous plant allows it to be placed in the landscape where it can easily show off its luxurious lusciousness. Does best with establishment.